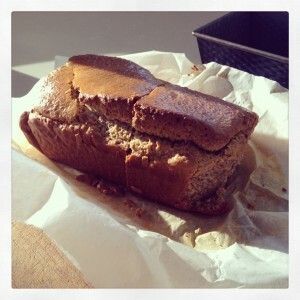 Paleo Bread – Gluten and Dairy Free Bread which actually tastes great! I love to experiment with recipes, particularly ones that take very little time to make. I recently served this bread up with some lentil soup and some lovely organic butter on a Friday night instead of getting a takeaway dinner, and it was an instant hit. This bread is really delicious; in fact my son had it for breakfast toasted the next day with raspberry chia jam alongside his chocolate granola! How spoilt! If you are looking for a great-tasting, gluten free, dairy free option, this recipe works a treat every time. Preheat oven to 180°C and line a loaf tin (21 x 11cm) with baking paper. Place the almond meal, flaxseed, chia and bicarbonate soda in a large bowl and combine. Whisk together the remaining ingredients and add to the dry ingredients to combine. If you have a food processor, you can simply mix all ingredients together and then pour into tin. Spoon into lined tin and bake 30-40 mins until inserted skewer comes out clean and the bread is golden on top. Cool on wire rack for 5 mins and then remove from tin to cool completely. This bread also freezes well, just cut into slices and wrap individually prior to freezing.